In this tutorial, I will show you how to convert HTML to pdf in PHP or how to transfer HTML to pdf using PHP by following simple steps. No need to be expert in PHP or HTML but little bit PHP and HTML knowledge is required. I am explaining to you in very basic language. Please follow the instructions. There are too many scripts are available on the internet to convert pdf to HTML in PHP. I have tried most of them and find the best one which is “TCPDF”. Why TCPDF is the best? It is free and many functions are available in this script. Also, functions are very easy to understand and implement. TCPDF is user-friendly and coding is very easy to understand. The main advantage of this script is a page break function. When your pdf pages are more than one then it works very charmingly. It will arrange all the design of your HTML in a very good manner. Rather other scripts can’t do it very well. Another advantage is the HTML table structure(tr-td). This script makes it very simple and attractive. When PDF goes to the next page then the design is messing up. Can’t fix proper table structure. Now I will show you how to set up all the things for transfer HTML to pdf using PHP and HTML. First of all, you have to download TCPDF library because we need this library to execute the code. You can download the library from click below button. Step 3: Now create “index.php” file and put the below code in this file. 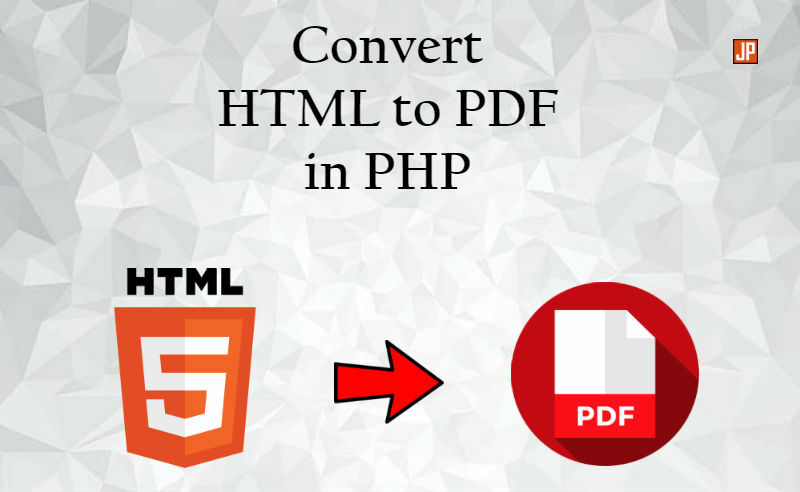 By following these steps you can easily convert HTML to pdf in PHP. That’s it, now you can execute the code and you will see your HTML code is converted into pdf. You can get more examples, functions, and demos on TCPDF official site. I hope you enjoyed this tutorial, please comment below and share it with your friends. How to reduce or compress images in PHP? How to Use Search Operators to Find Advanced Link Building Opportunities? How to Redirect HTTPS to HTTP using .htaccess File?